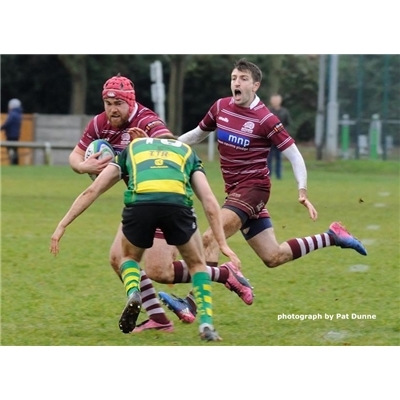 Hitchin 1XV extended their unbeaten league record to nine consecutive wins out of nine, but nearly paid for their complacency in this match, away against Staines. Early in the second-half Staines were awarded a penalty but the attempt at goal went wide. Hitchin struck back with a strong run by James Bolter from the 22, to go over for an unconverted try. The game became scrappy and a yellow card was shown to one player from either team and exchanges of penalties continued, with Staines being successful with one to make the scoreline 3 – 12 in favour of the visitors. Staines used the strong wind well to gain a territorial advantage, but the Hitchin defence held out and although the play switched between the respective 22s there was no further score.